Just a month back Samsung released a minor 40 MB update for Samsung Galaxy S3 I9300 running Android 4.1.2 ( Feels bad stuck on Android 4.1.2 for ages ) , Officially there were no change logs provided for the update but we can assume that it was probably an minor performance upgrade . As it is with installing an Official software update , My Samsung galaxy S3 was unrooted in this process . Once again i had to source for the latest CF auto root and Odin to root my Samsung galaxy S3 . In fact i even tried Framaroot which had previously worked on my Samsung galaxy S3 , but after the update Framaroot was unable to root my Galaxy S3 . So the only option i had left was to root my Samsung Galaxy S3 through Odin . If you had installed the same update , then follow the instructions below to manually root your Samsung Galaxy S3 I9300 using Odin and CF-Auto-Root by Chainfire . NOTE: This guide is only for users having the international version of the Samsung Galaxy S3 I9300 . Step 2: Install Odin on your PC and run it as Administrator . Now lets prepare your phone for rooting . 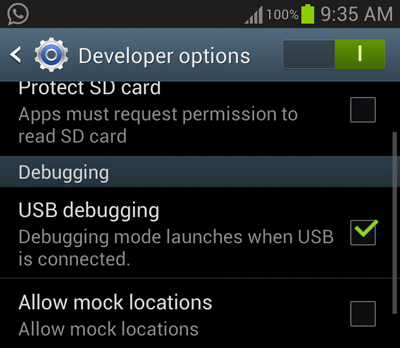 Step 3: Enable USB debugging in your phone . To enable USB debugging navigate to Settings > System > Developer options > Debugging > USB debugging . Step 4: Turn off your phone and turn on your phone into download mode by pressing the Volume down + Home + Power keys together . When your phone displays a warning , press the Volume up button to continue into Download mode . Step 5: Connect your Samsung galaxy S3 to your PC using a Data cable . Step 6: You should now see the Odin’s ID:COM status change into blue and an Added message will be displayed . Step 7: Check Auto reboot and F.Reset options in Odin . Step 8: Click on the PDA button and select the CF-Autoroot file . 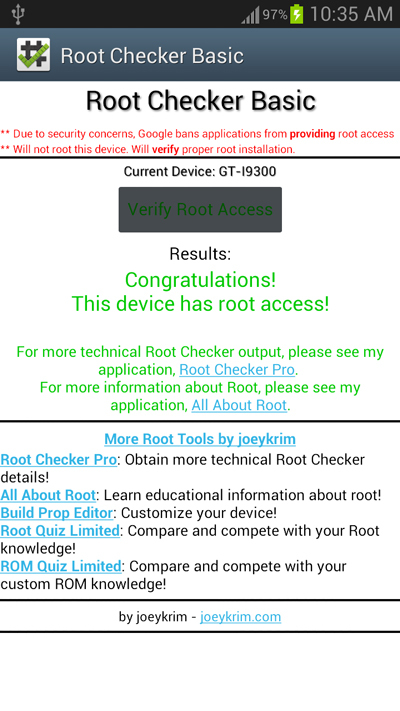 If you want to confirm whether your Samsung Galaxy S3 is rooted not then Install the Root checker app from the Google play store .Here is a screenshot of root checker app on my Samsung Galaxy S3 .